What can we learn from the image? Well, there's no camera hump, for one, which: excellent. The secondary glossy plastic (we think - it could be glass, though) pane on the back of the phones gives them an interesting two-tone look, and this black version looks downright stealthy. The rear of the phones have a gentle curve around the edges, with the fingerprint scanner sitting in the typical Nexus position. As far as we know, these phones are aluminum body, not polycarbonate. We're confident in this because we believe the "flagship" advertised color will be a standard aluminum finish with a white face, but we figured we'd share this dark gray / black version. We also believe Google is considering what I'd call an "electric blue" version of the Nexuses (white face, but blue glossy rear pane) that looks absolutely crazy, but we aren't sure if that'll actually come to market or not. 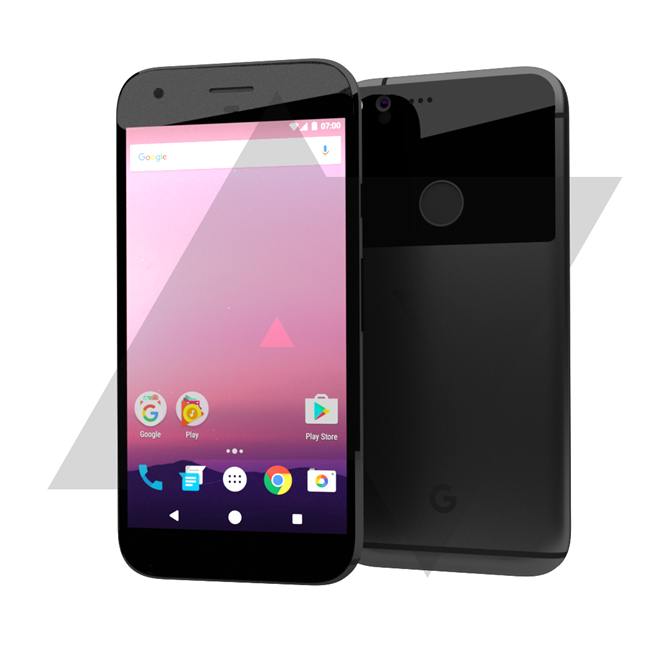 The design of the phones bears basically no resemblance to the HTC 10 (unless you believe HTC invented antenna lines), and also relatively little resemblance to the current Nexus phones, either. With that lone "G" logo and no Nexus branding - something we aren't confident at this point will remain in the final design - these phones look unlike any Nexus we've seen before. I see alittle 6P, I guess, in some respects, but this design really appears to be its own thing. When Sundar Pichai said Google was going to be more opinionated with the design of Nexus devices, he wasn't kidding. Remember to check out our specs posts for Marlinand Sailfish here and here.